This is a dream come true! Music has always been a big part of my life. 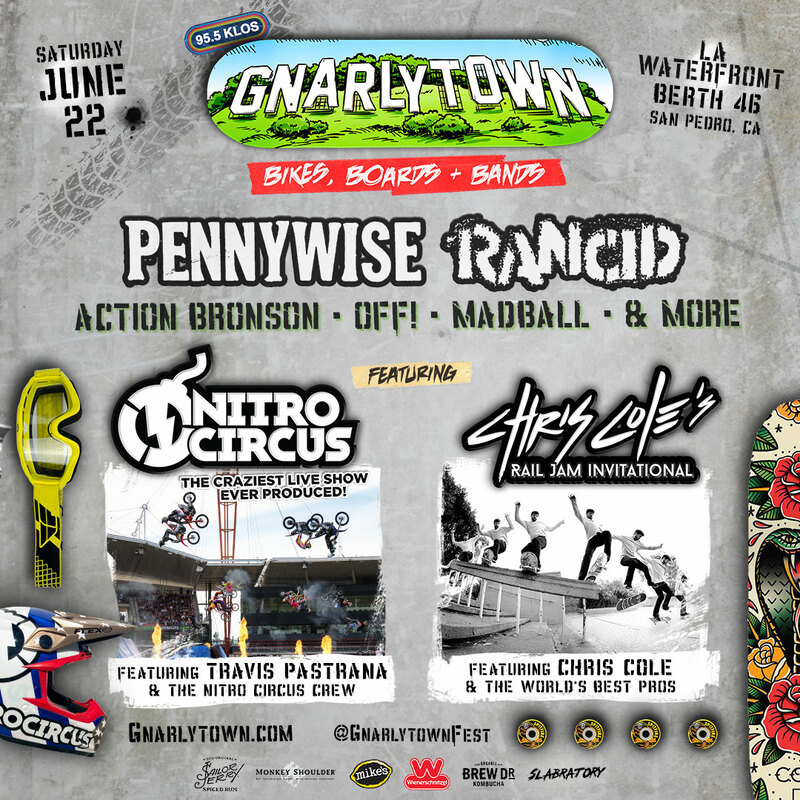 Gnarlytown will be in San Pedro, CA on Saturday June 22nd. Passes will go on sale this Friday, March 22nd at 10am PST, at gnarlytown.com. For the past few years I’ve been giving away a bunch of stuff from all my sponsors during the holidays. A few weeks ago I did another Holiday Hookup. Thunder Trucks box: Paul Saiki and James Mastalerz. Bones Bearings box: Jose Chong and Tiffany. Plan B box: Anthony Schmarge and Sofia. Spitfire wheels box: Brandon Le and Brad. Stance socks box: Kenneth Schmidgall and David. Kershaw knives box: Tim Shepard and Jeff. GoPro box: Amy Hellman and Chris. Grizzly Griptape box: Ceasar Torres and Jeremy. Thanks to everyone that has signed up! Hope you all have an amazing 2018. Live rad, don’t be lame. A few weeks ago I mounted my GoPro Hero 5 with the Karma Grip stabilizer on my son’s board. Figured I would try to film some clips with it in my backyard skatepark. A few weeks ago I went to Austin, TX and visited the Onnit headquarters. I had a great day checking out the facility, training with Erik Melland, and doing an interview with Aubrey Marcus for his podcast. I also did a Q&A for the Onnit website. Read the 20 or so questions and answers here. Just like last year I am blown away by the number of entries, and by a lot of the stories from everyone. Stoked to read people are down to hook up a friend that could use something nice, but mostly just a positive “I got your back” message from a close friend. 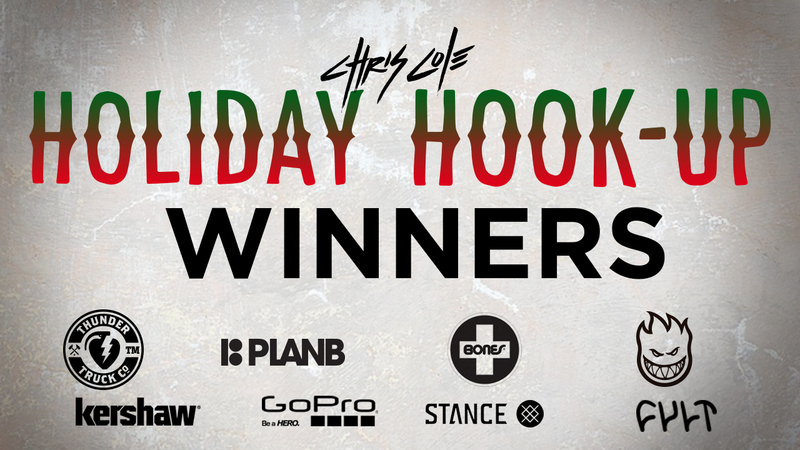 Almost 5,000 people signed up for the Holiday Hookup, and picking winners was not an easy task. Thank you to everyone that signed up! Joe Lamar and Tyler Keyton from Baltimore, MA. You’ll both get 6 pairs of socks. Kevin Magee and Mikale Erhart from Belgrade, MT. You’ll both get 2 sets of Bones Swiss bearings. Josh Chivers and Ellie Ford from Southampton, England. You both get 5 sheets of my signature griptape. Jon Henkel and Steven Maune from Saint Clair, MI. You’ll both get a set of the Team Hollows trucks. Josh Robinson and Ross Haynes from Lehi, UT. You both will get two pairs of shoes, a sweatshirt, and 3 shirts. Michael Esqueda and Christopher Rodriguez from South Gate, CA. You’ll both get one of my pro boards. Angel Matta and Jenifer Matta from Downey, CA. You’ll both get the 1776 link utility knife. Kurtis Bray and James Dexter from Carmarthenshire, Wales. You’ll both get some nice Reign items, including the limited DC X Reign t-shirt. Alexander Thomas and Curtis Henry from Shady Spring, WV. You’ll both get a set of the new Formula Four Radial Slims. Announced soon who will get a brand new complete BMX bike. Kory Hogan and Jason Stripling from Summerville, SC. You guys get a HERO 5 camera and a 3-way handle. Please check your email if your name is on the list. You have until Friday January 13th to claim your prizes. Special thanks to all my sponsors for hooking up all the prizes. Live rad, don’t be lame. -Chris Cole. 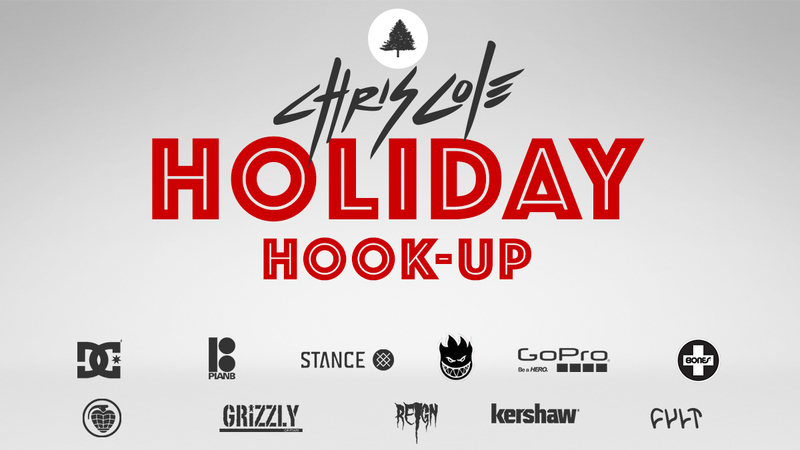 Holiday Hookup 2016 in full effect! In case you don’t follow me on Facebook, Twitter, or Instagram, I’m running another Holiday Hookup this year. My sponsors are helping me give out some rad products to someone who deserve it. All you have to do is tell me who you think should get a nice (extra) gift this holiday season. Just go to the giveaway page, pick a brand, and tell me about your friend who could use a nice gift this year. Looking forward to reading some of your stories. Enjoy the holidays and, as always, thank you for the support. http://chriscobracole.com/wp-content/uploads/2014/05/sliderlogo.png 0 0 admin http://chriscobracole.com/wp-content/uploads/2014/05/sliderlogo.png admin2016-12-21 20:06:542016-12-21 20:06:54Holiday Hookup 2016 in full effect! 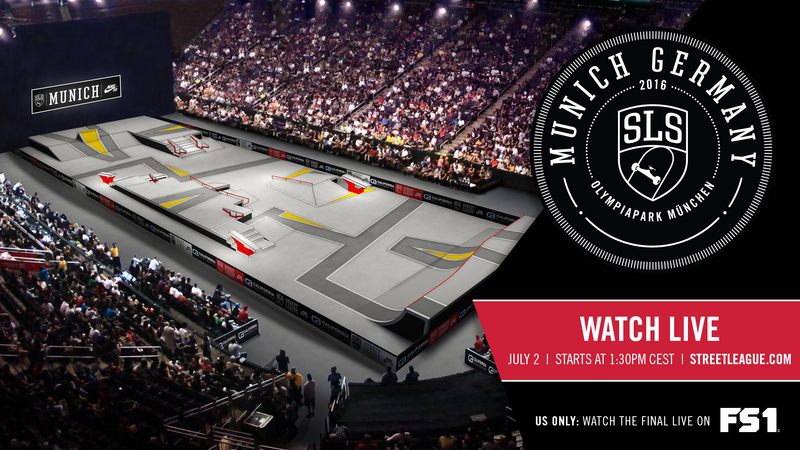 I’m flying to Munich, Germany today to skate the Street League contest on Saturday, July 2nd. If you can’t attend the contest you can watch it live on streetleague.com. It starts at 1.30pm ET. If you live in the United States you can watch the finals on Fox Sports 1. Hey everyone, let me start of by saying thanks again to everyone that signed up for the Holiday Hookup and wanting to take care of a close friend. It’s been rad to read all the entries from everyone. Almost 5,000 people signed up so it took me a little while to pick the winners. If it was up to me I would have picked all of them, but I had to narrow it down to 13 winners. On Wednesday I’ll pick and announce the grand prize winner, who gets a box of goods from all of my sponsors. You can still sign up for that on the giveaway page. 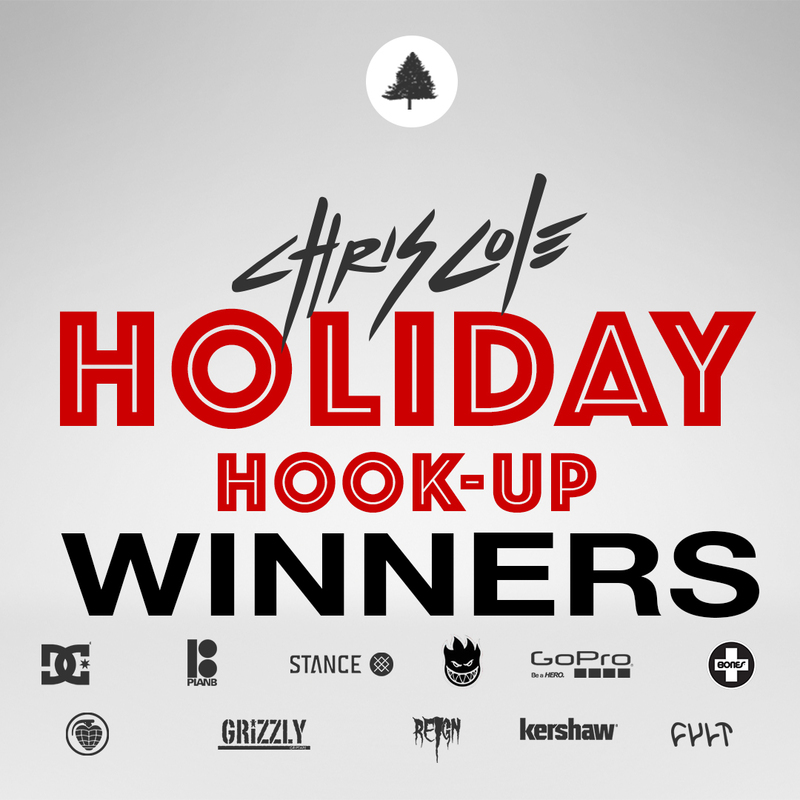 But enough typing for now, here are the winners of the 2015 Holiday Hookup. Hope everyone has a great 2016! Grand Prize winner – Trent Gonzales & Tommy Galyon. You guys won a box of products from all my sponsors. If you are one of the winners check your email and reply to the one we just sent out. **Will have to confirm that you are 16 years or older. We are ending the Holiday Hookup with Kershaw Knives. No knives this time, but they put together a nice little package so let me know which of your friends would be hyped to get some stuff. Go to the giveaway page to sign up. If you get picked you’ll get some stuff too. Winners are announced tomorrow afternoon, Monday January 4th. The grand prize winner is announced on Wednesday January 6th. Hope everyone had a great holiday! Thanks to everyone that signed up to take care of a close friend, it’s been rad to read all the stories from everyone. Back on the grind tomorrow! Only a few days left of the Holiday Hookup, but we have a few good things to give to some of your friends. Today Diamond Supply Co is in the mix. Diamond has been making the best bolts in the biz for a long time, and these they make a lot of other rad stuff. Go to the giveaway page and tell me which one of your friends should get a supply of Diamond goodies.